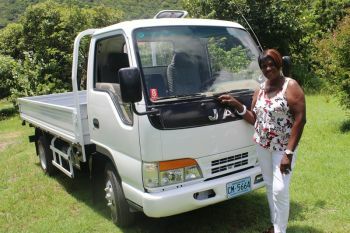 The presentation took place at the company’s Fish Bay lot shortly after 10 A.M.
“I’m proud of it, I never got a donation yet like that,” Fahie related before disclosing that the truck would be used to assist with transporting water and produce to and from her farm located at Paraquita Bay on Tortola. She noted that it would be particularly useful in transporting water given the difficulties being faced by local farmers with the important commodity that has proven so troublesome to acquire at Paraquita Bay. Both Mr Wong and Ms Fahie expressed that they have known each other for years and have had a close association fuelled by their common appreciation and love for gardening and farming. “When you’re blessed you’re blessed; they killed my donkey but God is still good,” Ms Fahie remarked in reference to the loss of her donkey that was discovered dead sometime in May. 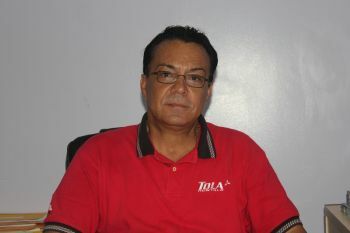 Wong, who noted that he wanted no publicity out of the issue, said he was simply making a donation to a friend but Fahie persuaded him to make the donation public as an expression of her gratitude and in attempts to show what members of the business community can and are doing to give back to local farmers. Fahie encouraged the government to be likeminded and to take a cue in providing incentives for farmers who were striving to be productive. The businessman said he had the truck at his disposal and it was not in use so he decided to make the donation after hearing of Fahie’s difficulties in transporting produce to and from town as well as her problems being experienced with transporting water to and from her farm. “Water is the main ingredient in gardening and farming,” Wong stated while suggesting that the farmer can now use the donation to alleviate her woes significantly. gee, TWO wows.. you are moving up. now try a sentence. I really like to read these sort of stories. Such a change from all the negative issues that surrounds us daily. That donkey ate the same dog poision set. Lets see if she will help other farmers to transport their water now!!!! Everyone wants to recieve but nobody wants to give. this is very exciting. made my eyes water. Very kind indeed. Gestures like this rumble across the land waking people up to generosity that helps everyone- even if it is just good feelings. thank you for restoring my faith in human beings! why the dislike button? it is one person's opinion. small... very small indeed. I hope more business will consider giving back like this business just did. Keep up the good work. I have always supported Tola and last week I got 4 new tires from them. I never knew who Mr. Wong was and I see now that he is my neighbor. Small Island. What a magnificient story. It brought tears to my eyes. Are you all aware that Ms. Fahie is not only a farmer, but during the festival parade the star and a true BVI-Ambassador, when she showcases her fantastic outfits, all created and made by her, without ever begging a penny from Tourist Board or Government. I couldn'tthink of a more deserving person to get that donation. Kuds to Bruce!! I am so impress and proud for this from Tola Mitsubishi, Mr Bruce Wong. Hope more corporate BVI will follow his lead. Speaks volume! Round of applause Tola Mitsubushi! A wonderful example of corporate citizenship! I am very impressed and extremely grateful for the kindness shown to a lady I admire very much! Bruce kudos! A good corporate gesture of love for the Community!